These inspiration cards are based on text from the fabulous Dr. Wayne Dyer's book, Inspiration. A creative and truly motivational speaker, Dr. Dyer can be seen on public television at any given time, pacing the stage and delivering uplifting and incredibly helpful words. I've sometimes been brought to tears listening to his lectures, if you will. By choosing a card at random from this selection, every day, you'll receive an inspiring quote to rattle around your brain, to ponder, and use to uplift yourself. Many people chant or repeat a quote, slogan, words, sayings, or some such, to help the message sink in, while others need just to read something inspirational to be satisfied. By doing whatever it is you do to be a better person, is a huge step to peace of mind and personal growth. 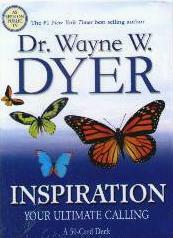 Dr. Dyer says about finding and using inspiration, "...you're not judging others or yourself. You aren't bothered by behaviors or attitudes that in uninspired moments are frustrating." Dr. Dyer offers inspirations through "engaging your spirit", "joy", and "truth" among others. Each card has a beautiful picture and they have a glossy finish to withstand much handling. I will be leaving the deck where I can see them every day, and leaving a new card upturned each day. Visit Dr. Dyer at his website at www.DrWayneDyer.com. Conclusion - These cards will make wonderful gifts as well as being beneficial to you. please use the PayPal button below. Thank you kindly. Website design and © Adrienne Petterson 2003-2006.